, one of the most eminent and highly-distinguished writers of the eighteenth century, was born on the 18th of September, 1709, at Lichfield in Staffordshire, where his father, Michael Johnson, a native of Derbyshire, of obscure extraction, was at that time a bookseller and stationer. His mother, Sarah Ford, was a native of Warwickshire, and sister to Dr. Ford, physician, who was father to Cornelius Ford, a clergyman of loose character, whom Hogarth has satirized in the print of Modern Midnight Conversation. Our author was the eldest of two sons. Nathaniel, the youngest, died in 1737 in his twenty-fifth year. The father was a man of robust body and active mind, yet occasionally depressed by melancholy, which Samuel inherited, and, with the aid of a stronger mind, was not always able to shake off. He was also a steady high-churchman, and an adherent of the house of Stuart, a prejudice which his son outlived in the nation at large, without entirely conquering in himself. Mrs. Johnson was a woman of good natural understanding, unimproved by education; and our author acknowledged with gratitude, that she endeavoured to instil sentiments of piety as soon as his mind was capable of any instruction. There is little else in his family history worthy of notice, nor had he much pleasure in tracing his pedigree. He venerated others, however, who could produce a recorded ancestry, and used to say, that in him this was disinterested, for he could scarcely teil who was his grandfather. That he was remarkable in his early years has been supposed, but many proofs have not been advanced by his biographers. He had, indeed, a retentive memory, and soon discovered symptoms of an impetuous temper; but these circumstances are not enough to distinguish him from hundreds of children who never attain eminence. In his infancy he was afflicted with the scrophula, which injured his sight, and he was carried to London to receive the royal touch from the hand of queen Anne, the last of our sovereigns who encouraged that popular superstition. | He was first taught to read English by a woman who kept a school for young children at Lichfield; and afterwards by one Brown. Latin he learned at Lichfield school, under Mr. Hunter, a man of severe discipline, but an attentive teacher. Johnson owned that he needed correction, and that his master did not spare him; but this, instead of being the cause of unpleasant recollections in his advanced life, served only to convince him that severity in school-education is necessary; and in all his conversations on the subject, he persisted in pleading for a liberal use of the rod. At this school his superiority was soon acknowledged by his companions, who could not refuse submission to the ascendancy which he acquired. His proficiency, however, as in every part of his life, exceeded his apparent diligence. He could learn more than others in the same allotted time: and he was learning when he seemed to be idle. He betrayed an early aversion to stated tasks, but, if roused, he could recover the time he appeared to have lost with great facility. Yet he seems afterwards to have been conscious that much depends on regularity of study, and we find him often prescribing to himself stated portions of reading, and recommending the same to others. No man perhaps was ever more sensible of his failings, or avowed them with more candour; nor, indeed, would many of them have been known, if he had not exhibited them as warnings. His memory was uncommonly tenacious, and to his last days he prided himself on it, considering a defect of memory as the prelude of total decay. Perhaps be carried this doctrine rather too far when he asserted, that the occasional failure of memory in a man of seventy must imply something radically wrong; but it may be in. general allowed, that the memory is a pretty accurate standard of mental strength. Although his weak sight prevented him from joining in the amusements of his schoolfellows, for which he was otherwise well qualified by personal courage and an ambition to excel, he found an equivalent pleasure in sauntering in the fields, or reading such books as came in his way, particularly old romances. For these he retained a fondness throughout life; but was wise and candid enough to attribute to them, in some degree, that unsettled turn of mind which prevented his fixing in any profession. By what means his father was enabled to defray the expence of an university education has not been very accurately told. It is generally reported that he went to assist the studies of a young gentleman of the name of Corbet. 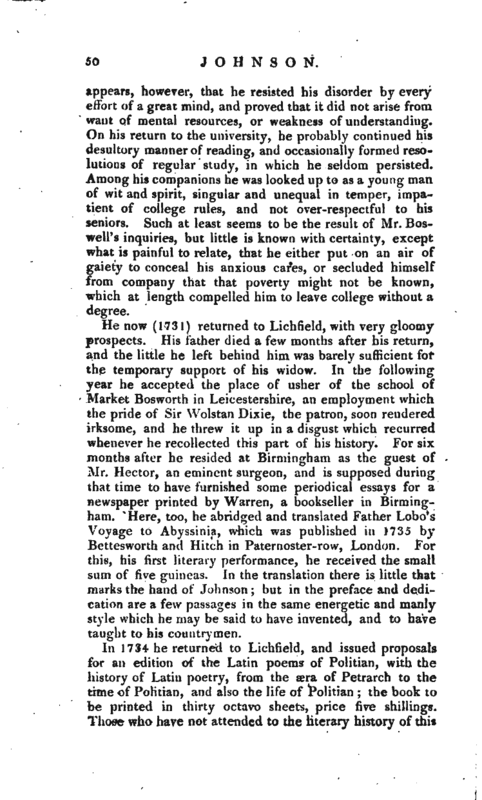 His frfend, Dr. Taylor, assured Mr. Boswell that he never could have gone to college, had not a gentleman of Shropshire, one of his schoolfellows, spontaneously undertaken to support him at Oxford, in the character of his companion,- though, in fact, he never received any assistance whatever from that gentleman. He was, however, entered a commoner of Pembroke college on the 31st October, 1728. 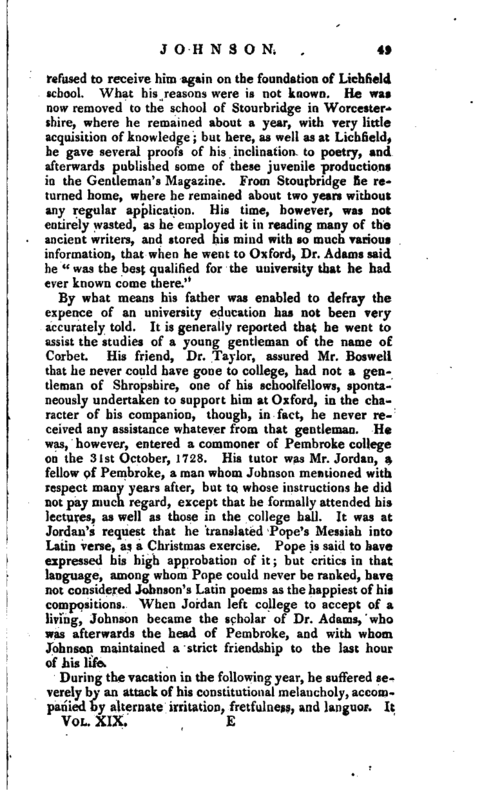 His tutor was Mr. Jordan, a fellow of Pembroke, a man whom Johnson mentioned with respect many years after, but to whose instructions he did not pay much regard, except that he formally attended his lectures, as well as those in the college hall. It was at Jordan’s request that he translated Pope’s Messiah into Latin verse, as a Christmas exercise. 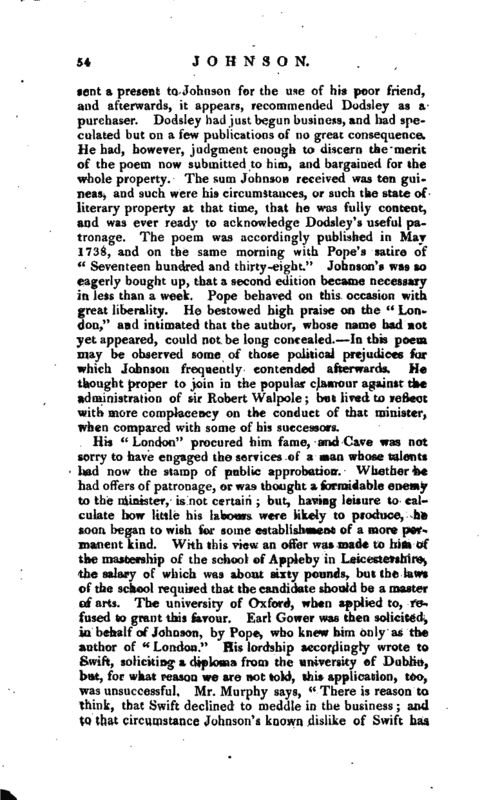 Pope is said to have expressed his high approbation of it; but critics in that language, among whom Pope could never be ranked, have not considered Johnson’s Latin poems as the happiest of his compositions. When Jordan left college to accept of a living, Johnson became the scholar of Dr. Adams, who was afterwards the head of Pembroke, and with whom Johnson maintained a strict friendship to the last hour of his life. During the vacation in the following year, he suffered severely by an attack of his constitutional melancholy, accompanied by alternate irritation, fretfulness, and languor. It | appears, however, that he resisted his disorder by every effort of a great mind, and proved that it did not arise from want of mental resources, or weakness of understanding. On his return to the university, he probably ‘continued his desultory manner of reading, and occasionally formed resolutions of regular study, in which he seldom persisted. Among his companions he was looked up to as a young man of wit and spirit, singular and unequal in temper, impatient of college rules, and not over-respectful to his seniors. 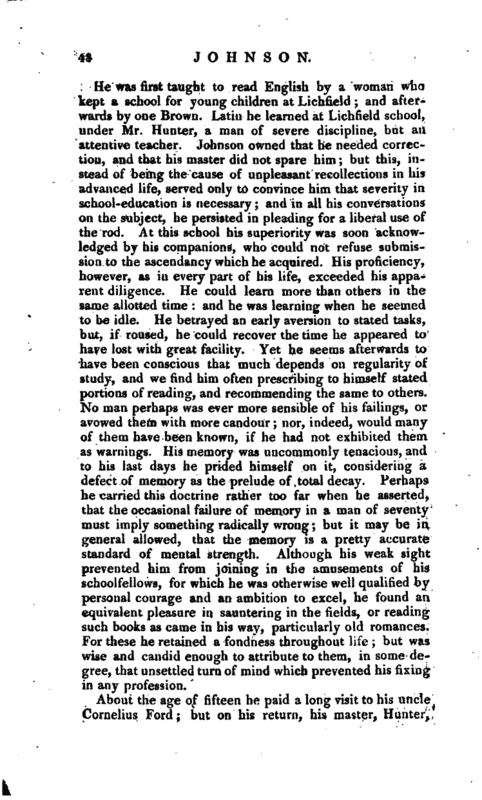 Such at least seems to be the result of Mr. Boswell’s inquiries, but little is known with certainty, except what is painful to relate, that he either put on an air of gaiety to conceal his anxious cares, or secluded himself from company that that poverty might not be known, which at length compelled him to leave college without a degree. He now (1731) returned to Lichfield, with very gloomy prospects. His father died a few months after his return, and the little he left behind him was barely sufficient for the temporary support of his widow. In the following year he accepted the place of usher of the school of Market Bosworth in Leicestershire, an employment which the pride of Sir Wolstan Dixie, the patron, soon rendered irksome, and he threw it up in a disgust which recurred whenever he recollected this part of his history. For six months after he resided at Birmingham as the guest of Mr. Hector, an eminent surgeon, and is supposed during that time to have furnished some periodical essays for a newspaper printed by Warren, a bookseller in Birmingham. Here, too, he abridged and translated Father Lobo’s Voyage to Abyssinia, which was published in 1735 by Bettesworth and Hitch in Paternoster-row, London. For this, his first literary performance, he received the small sum of five guineas. In the translation there is little that marks the hand of Johnson; but in the preface and dedication are a few passages in the same energetic and manly style which he may be said to have invented, and to have taught to his countrymen. In 1734 he returned to Lichfield, and issued proposals for an edition of the Latin poems of Politian, with the history of Latin poetry, from the aera of Petrarch to the time of Politian, and also the life of Politian; the book to be printed in thirty octavo sheets, price five shillings. 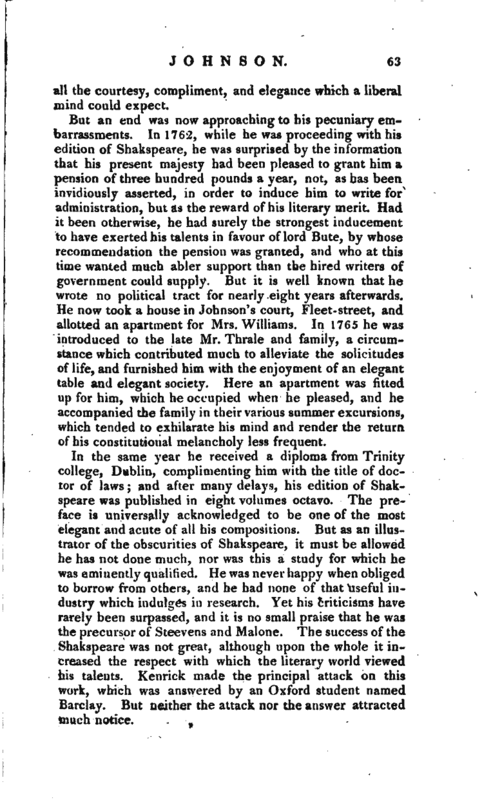 Those who have not attended to the literary history of this | country will be surprized that such a work could not be undertaken without the precaution of a subscription; and they will regret that in this case the subscription was so inadequate to the expence of printing, as to deter our author from executing what probably would have made him known and patronized by the learned world. 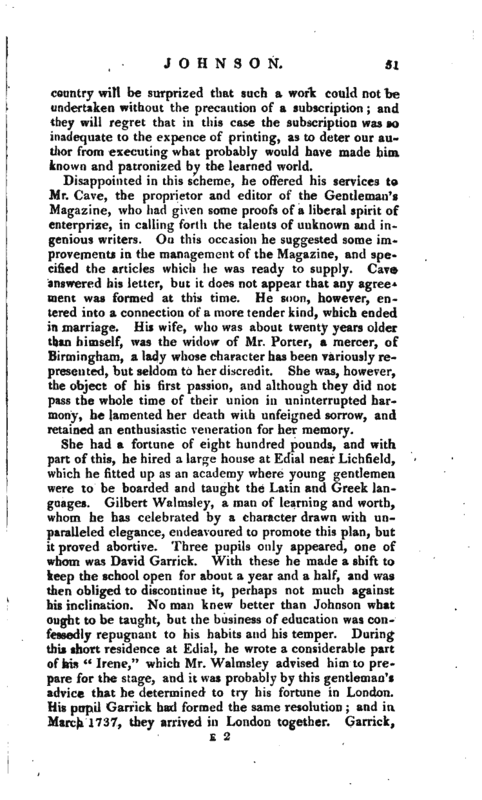 Disappointed in this scheme, he offered his services to Mr. Cave, the proprietor and editor of the Gentleman’s Magazine, who had given some proofs of a liberal spirit of enterprize, in calling forth the talents of unknown and ingenious writers. On this occasion he suggested some improvements in the management of the Magazine, and specified the articles which he was ready to supply. Cave answered his letter, but it does not appear that any agreement was formed at this time. He soon, however, entered into a connection of a more tender kind, which ended in marriage. His wife, who was about twenty years older than himself, was the widow of Mr. Porter, a mercer, of Birmingham, a lady whose character has been variously represented, but seldom to her discredit. She was, however, the object of his first passion, and although they did not pass the whole time of their union in uninterrupted harmony, he lamented her death with unfeigned sorrow, and retained an enthusiastic veneration for her memory. She had a fortune of eight hundred pounds, and with part of this, he hired a large house at Edial near Lichfield, which he fitted up as an academy where young gentlemen were to be boarded and taught the Latin and Greek languages. Gilbert Walmsley, a man of learning and worth, whom he has celebrated by a character drawn with unparalleled elegance, endeavoured to promote this plan, but it proved abortive. Three pupils only appeared, one of whom was David Garrick. With these he made a shift to keep the school open for about a year and a half, and was then obliged to discontinue it, perhaps not much against his inclination. No man knew better than Johnson. what ought to be taught, but the business of education was confessedly repugnant to his habits and his temper. During this short residence at Edial, he wrote a considerable part of his “Irene,” which Mr. Walmsley advised him to prepare for the stage, and it was probably by this gentleman’s advice that he determined to try his fortune in London. His pupil Garrick had formed the same resolution; and in March 1737, they arrived in London together. Garrick, | after some farther preparatory education, was designed far the study of the law, but in three or four years went on the stage, and obtained the highest honours that dramatic fame could confer, with a fortune splendid beyond all precedent. The difference in the lot of these two young men might lead to many reflections on the taste of the age, and the value of its patronage; but they are too obvious to be obtruded on any reader of feeling or judgment, and to others they would be unintelligible. In what manner Johnson was employed for some time after his arrival in London, is not known. He brought a small sum of money with him, and he husbanded it with frugality, while he mixed in such society as was accessible to a friendless and uncourtly scholar, and amused himself in contemplating the manners of the metropolis. It appears that at one time he took lodgings at Greenwich, and proceeded by fits to complete his tragedy. He renewed his application also to Cave, sending him a specimen of a translation of the “History of the Council of Trent,” and desiring to know if Cave would join in the publication of it. Cave appears to have consented, for twelve sheets were printed, for which our author received forty-nine pounds; but another translation being announced about the same period (1738) by a rival whose name was also Samuel Johnson, librarian of St. Martin’s in the Fields, our author desisted, and this other design was also dropped. In the ourse of the summer he went to Lichfield, where he had left Mrs. Johnson, and there, during a residence of three months, finished his tragedy for the stage. On his return to London with Mrs. Johnson, he endeavoured to prevail on Fleetwood, the patentee of Drurylane theatre, to accept “Irene,” but in this was unsuccessful, and having no interest with any other manager, he laid aside his play in pursuit of literary employment. He had now become personally known to Cave, and began to contribute to the Magazine original poetry, Latin and English, translations, biographical sketches, and other miscellaneous articles, particularly the debates in parliament, under the name of the Senate of Lilliput. At that time the debates were not allowed to be published, as now, the morning after the day of meeting, and the only safe mode of conveying the substance of them to the public was by adopting a historical form at more distant periods. At first | Johnson merely revised the manuscript as written by Guthrie*, who then supplied this department of the Magazine; but when he had attained a higher rank among authors, the whole devolved on his coadjutor. His only ma^ terials were a few notes supplied by persons who attended the houses of parliament, from which, and sometimes from information even more scanty, he compiled a series of speeches, of which the sentiments as well as the style were often his own. In his latter days he disapproved of this practice, and desisted from writing the speeches as soon as he found they were thought genuine. The value of his contributions to this Magazine must have been soon acknowledged. It was then in its infancy, and there is a visible improvement from the time he began to write for it. Cave had a contriving head, but with too much of literary quackery. 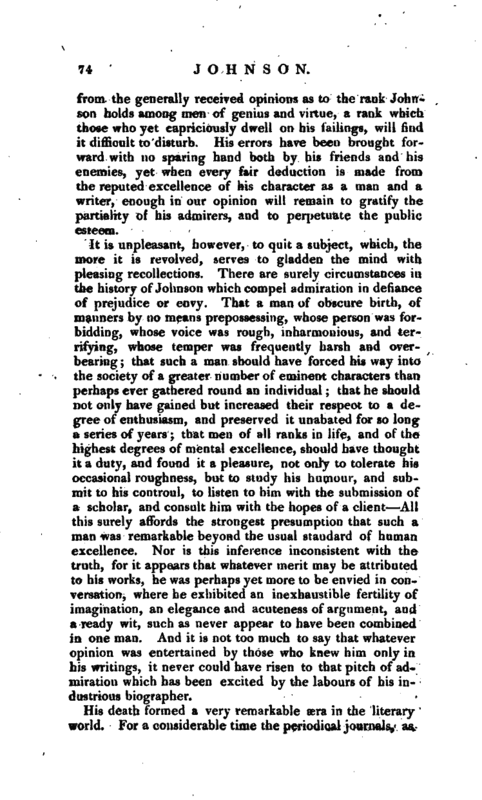 Johnson, by recommending original or selected pieces calculated to improve the taste and judgment of the public, raised the dignity of the Magazine above its contemporaries; and to him we certainly owe, in a great measure, the various information and literary history for which that miscellany has ever been distinguished, and in which it has never been interrupted by a successful rival. 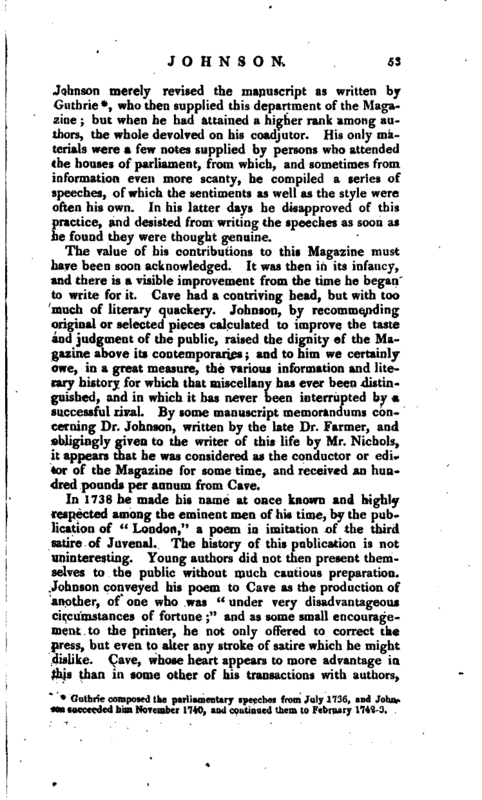 By some manuscript memorandums concerning Dr. Johnson, written by the late Dr. Farmer, and obligingly given to the writer of this life by Mr. Nichols, it appears that he was considered as the conductor or editor of the Magazine for some time, and received an hundred pounds per annum from Cave. Guthrie composed the parliamentary speeches from July 1736, and Johnson succeeded him November 1740, and continued them to February 1742-3. | sent a present to Johnson for the use of his poor friend, and afterwards, it appears, recommended Dodsley as a purchaser. Dodsley had just begun business, and had speculated but on a few publications of no great consequence. He had, however, judgment enough to discern the merit of the poem now submitted to him, and bargained for the whole property. The sum Johnson received was ten guineas, and such were his circumstances, or such the state of literary property at that time, that he was fully content, and was ever ready to acknowledge Dodsley’s useful patronage. The poem was accordingly published in May 1738, and on the same morning with Pope’s satire of “Seventeen hundred and thirty-eight.” Johnson’s was so eagerly bought up, that a second edition became necessary in less than a week. *Pope behaved on this occasion with great liberality. He bestowed high praise on the “London,” and intimated that the author, whose name had not yet appeared, could not be long concealed. In this poem may be observed some of those political prejudices for which Johnson frequently contended afterwards. He thought proper to join in the popular clamour against the administration of sir Robert YValpole; but lived to reflect with more complacency on the conduct of that minister, when compared with some of his successors. His “London” procured him fame, and Cave was not sorry to have engaged the services of a man whose talent* had now the stamp of public approbation. Whether he had offers of patronage, or was thought a formidable enemy to the minister, is not certain; but, having leisure to calculate how little his labours were likely to produce, he soon began to wish for some establishment of a more permanent kind. With this view an offer was made to him of the mastership of the school of Appleby in Leicestershire, the salary of which was about sixty pounds, but the laws of the school required that the candidate should be a master of arts. The university of Oxford, when applied to, refused to grant this favour. Earl Gower was then solicited, in behalf of Johnson, by Pope, who knew him only as the author of “London.” His lordship accordingly wrote to Swift, soliciting a diploma from the university of Dublin, but, for what reason we are not told, this application, too, was unsuccessful. Mr. Murphy says, “There is reason to think, that Swift declined to meddle in the business; and to that circumstance Johnson’s known dislike of Swift has | been often imputed.” That Swift declined to meddle in the business is not improbable, for it appears by his letters of this date (August 1738) that he was incapable of attenc(­ing to any business; but Johnson’s Life of Swift proves that his dislike had a more honourable foundation. About this time Johnson formed a design of studying the civil law, in order to practise in the Commons, yet this also was rendered impossible for want of a degree, and he was obliged to resume his labours in the Gentleman’s Magazine. The various articles which came from his pen are enumerated in chronological series by Mr. Boswell. It will be sufficient for our purpose to notice only his more important productions, or such as were of sufficient consequence to be published separately. 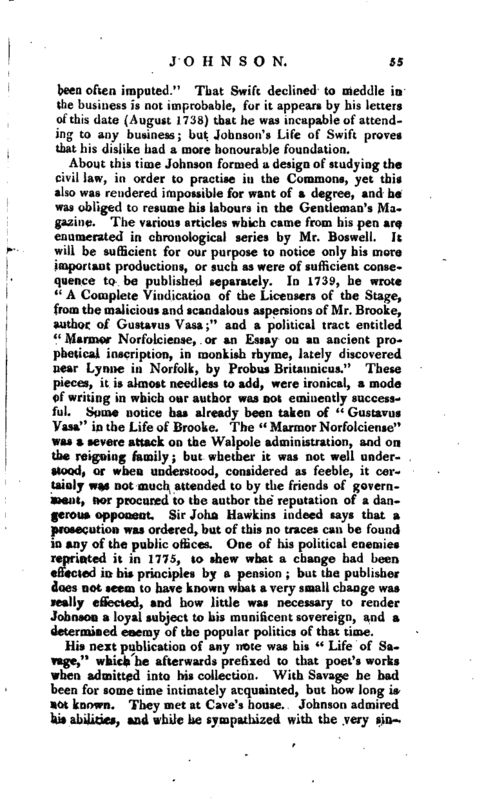 In 1739, he wrote “A Complete Vindication of the Licensers of the Stage, from the malicious and scandalous aspersions of Mr. Brooke, author of Gustavus Vasa;” and a political tract entitled t( Marmor Norfolciense, or an Essay on an ancient prophetical inscription, in monkish rhyme, lately discovered near Lynne in Norfolk, by Probus Britannicus.“These pieces, it is almost needless to add, were ironical, a mode of writing in which our author was not eminently successful. Some notice has already been taken of” Gustavus Vasa“in the Life of Brooke. The” Marmor Norfolciense" was a severe attack on the Walpole administration, and on the reigning family; but whether it was not well understood, or when understood, considered as feeble, it certainly was not much attended to by the friends of government, nor procured to the author the reputation of a dangerous opponent. Sir John Hawkins indeed says that a prosecution was ordered, but of this no traces can be found in any of the public offices. 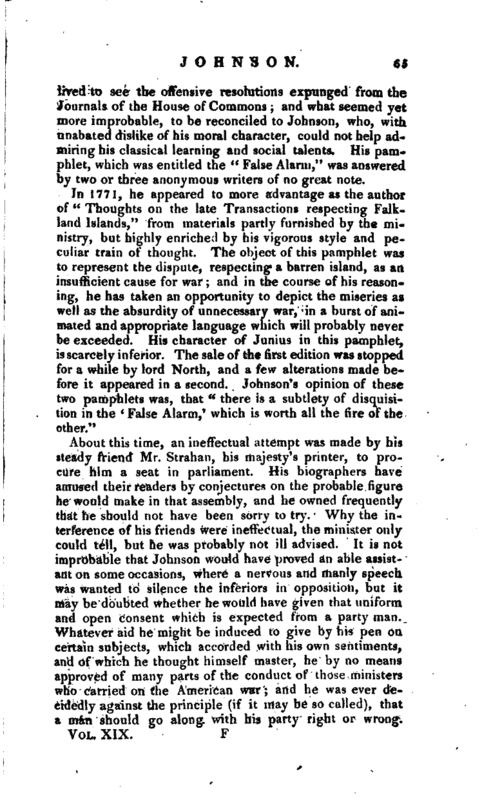 One of his political enemies reprinted it in 1775, to shew what a change had been effected in his principles by a pension; but the publisher does not seem to have known what a very small change was really effected, and how little was necessary to render Johnson a loyal subject to his munificent sovereign, and a determined enemy of the popular politics of that time. His next publication of any note was his “Life of Savage,” which he afterwards prefixed to that poet’s works when admitted into his collection. With Savage he had been for some time intimately acquainted, but how long is not known. They met at Cave’s house. Johnson admired his abilities, and while he sympathized with the very | singular train of misfortunes which placed him among the indigent, was not less touched by his pride of spirit, and the lofty demeanour with which he treated those who neglected him. In all Savage’s virtues, there was much in common with Johnson, but his narrative shows with what nicety he could separate his virtues from his vices, and blame even firmness and independence when they degenerated into obstinacy and misanthropy. He has concealed none of Savage’s failings; and what appears of the exculpatory kind is merely an endeavour to present a just view of that unfortunate combination of circumstances, by which Savage was driven from the paths of decent and moral life; and to incite every reflecting person to put the important question “who made me to differ” This Life, of which two editions were very speedily sold, affords an extraordinary proof of the facility with which Johnson composed. He wrote forty-eight pages of the printed copy in the course of a day or night, for it is not very clear which. His biographer, who records this, enters at the same time into a long discussion intended to prove that Savage was not the* son of the countess of Macclesfield; but had this been possible, it would surely have been accomplished when the proof might have been rendered unanswerable. 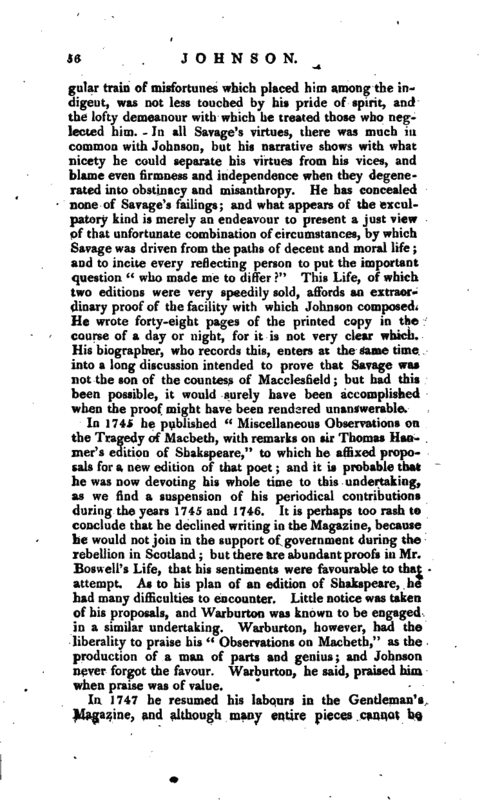 In 1745 he published “Miscellaneous Observations on the Tragedy of Macbeth, with remarks on sir Thomas Hanmer’s edition of Shakspeare,” to which he affixed proposals fora new edition of that poet; and it is probable that he was now devoting his whole time to this undertaking, as we find a suspension of his periodical contributions during the years 1745 and 1746. 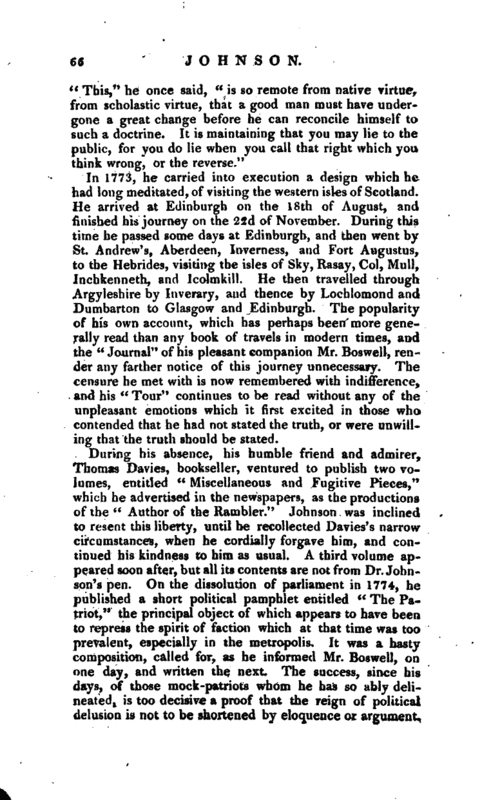 It is perhaps too rash to conclude that he declined writing in the Magazine, because he would not join in the support of government during the rebellion in Scotland; but there are abundant proofs in Mr. Boswell’s Life, that his sentiments were favourable to that attempt. As to his plan of an edition of Shakspeare, he had many difficulties to encounter. Little notice was taken of his proposals, and Warburton was known to be engaged in a similar undertaking. Warburton, however, had the liberality to praise his “Observations on Macbeth,” as the production of a man of parts and genius; and Johnson never forgot the favour. Warburton, he said, praised him when praise was of value. The design of this great work was at first suggested by Dodsley; and Johnson, having consented to undertake it, entered into an agreement with the booksellers for the sum of fifteen hundred guineas, which he was to receive in small payments proportioned to the quantity of manuscript sent to the press. The plan was addressed to the celebrated earl of Chesterfield, who had discovered an inclina* tion to be the patron of the author; and Johnson, having made suitable preparations, hired a house in Gough-square, engaged amanuenses, and began a task which he carried on by fits, as inclination and health permitted, for nearly eight years. His amanuenses were six in number, and employed upon what may be termed the mechanical part of the work, but their expences and his own were so considerable, that before the work was concluded he had received the whole of the money stipulated for in his agreement with the proprietors. In what time it might have been completed, had he, to use his own phrase, “set doggedly about it,” it is useless to conjecture, and it would perhaps have been hurtful to try. 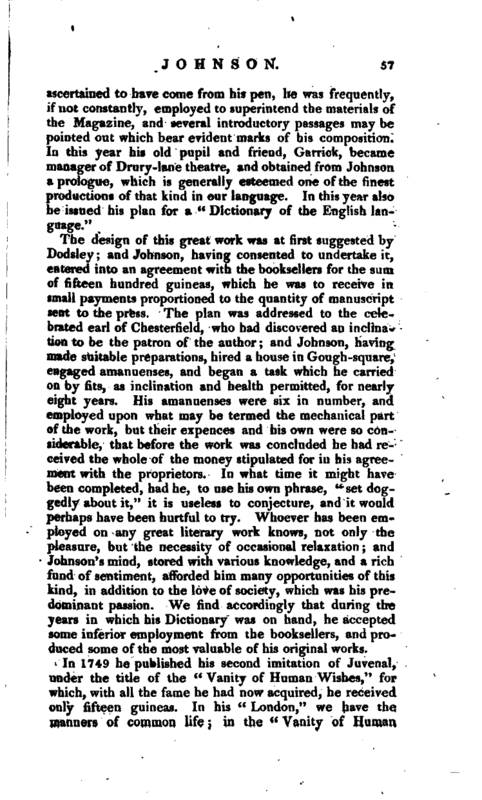 Whoever has been employed on any great literary work knows, not only the pleasure, but the necessity of occasional relaxation; and Johnson’s mind, stored with various knowledge, and a rich fund of sentiment, afforded him many opportunities of this kind, in addition to the love of society, which was his predominant passion. We find accordingly that during the years in which his Dictionary was on hand, he accepted some inferior employment from the booksellers, and produced some of the most valuable of his original works. In 1749 he published his second imitation of Juvenal, under the title of the “Vanity of Human Wishes,” for which, with all the fame he had now acquired, he received only fifteen guineas. In his “London,” we have the manners of common life 5 in the “Vanity of Human | Wishes,” he has given us more of his own mind, more of that train of sentiment, excited sometimes by poverty, and sometimes by disappointment, which always inclined him to view the gloomy side of human affairs. In the same year Garrick offered to produce his " Irene‘ 7 on the DruryJane theatre, but presumed at the same time to suggest such alterations as his superior knowledge of stage effect might be supposed to justify. Johnson did not much like that his labours should be revised and amended at the pleasure of an actor, and with some difficulty was persuaded to yield to Garrick’s advice. The pl^y, however, was at length performed, but without much success; altnough the manager contrived to have it played long enough to entitle the author to the profits of his three nights, and Dodsley bout ht the copyright for one hundred pounds. It has ever been admired in the closet, for the propriety of its sentiments and the elegance of its language. In 1750 he commenced a work which raised his fame higher than it had ever yet reached, and will probably convey his name to the latest posterity. He appears to have entered on “The Rambler” without any communication with his friends, or desire of assistance. Whether he proposed the scheme himself, is uncertain, but he Was fortunate in forming a connexion with Mr. John Payne, a bookseller in Paternoster-row, and afterwards chief accountant in the Bank of England, a man with whom he lived many years in habits of friendship, and who on the present occasion treated him with great liberality. He engaged to pay him two guineas for each paper, or four guineas per week, which at that time must have been to Johnson a very considerable sum; and he admitted him to a share of the future profits of the work, when it should be collected into volumes; this share Johnson afterwards sold. As a full history of this paper has been given in another work *, it may suffice to add, that it began Tuesday, March 20, 1749-50, and closed on Saturday, March 14, 1752. So conscious was Johnson that his fame would in a great measure rest on this production, that he corrected the first two editions with the most scrupulous care, of which specimens are given in the volume referred to in the note. British Essayists, vol. XIX. Preface to the Rambler. | Rambler;” and besides some occasional contributions to the Magazine, assisted in the detection of Lauder, who had imposed on him and on the world by advancing forged evidence that Milton was a gross plagiary. Dr. Douglas, the late bishop of Salisbury, was the first who refuted this unprincipled impostor; and Johnson, whom Lauder’ s ingenuity had induced to write a preface and postscript to his work, now dictated a letter addressed to Dr. Douglas, acknowledging his fraud in terms of contrition, which Lauder subscribed. The candour of Johnson on this occasion was as readily acknowledged at that time, as it has since been misrepresented by the bigotted adherents to Milton’s politics. Lauder, however, returned to his “dirty work,” and published in 1754, a pamphlet entitled “The Grand Impostor detected, or Milton convicted of forgery against Charles 1.” which was reviewed, with censure, in the Gentleman’s Magazine of that year, and probably by Johnson. 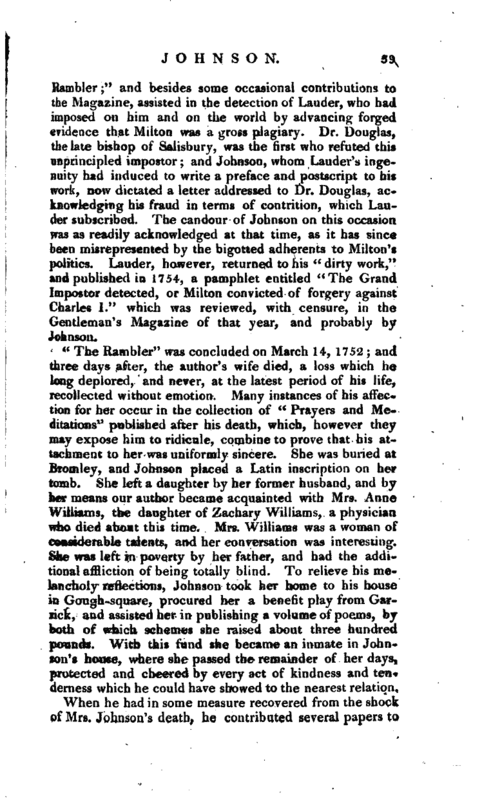 < ( The Rambler“was concluded on March 14, 1752 and three days after, the author’s wife died, a loss which he Jong deplored, and never, at the latest period of his life, recollected without emotion. Many instances of his affec* tion for her occur in the collection of” Prayers and Meditations" published after his death, which, however they may expose him to ridicule, combine to prove that his attachment to her was uniformly sincere. She was buried at Bromley, and Johnson placed a Latin inscription on her tomb. She left a daughter by her former husband, and by her means our author became acquainted with Mrs. Anne Williams, the daughter of Zachary Williams, a physician who died about this time. Mrs. Williams wasa woman of considerable talents, and her conversation was^interesting. She was left in poverty by her father, and had the additional affliction of being totally blind. To relieve his melancholy reflections, Johnson took her home to his house in Gough-square, procured her a benefit play from Garrick, and assisted her in publishing a volume of poems, by both of which schemes she raised about three hundred pounds. With this fund she became an inmate in Johnson’s house, where she passed the remainder of her days, protected and cheered by every act of kindness and tenderness which he could have showed to the nearest relation. See this matter explained in the preface to the Adventurer, British Essayists, vol. XXIII. In 1754 we find him approaching to the completion of his “Dictionary.” Lord Chesterfield, to whom he once looked up as to a liberal patron, had treated him with neglect, of which, after Johnson declined to pay court to such a man, he became sensible, and, as an effort at reconciliation, wrote two papers in the “World,” recommending the Dictionary, and soothing the author by some ingenious compliments. Had there been no previous offence, it is probable this end would have answered, and Johnson would have dedicated the work to him. He loved praise, and from lord Chesterfield, the Maecenas of the age, and the most elegant of noble writers, praise was at this time valuable. 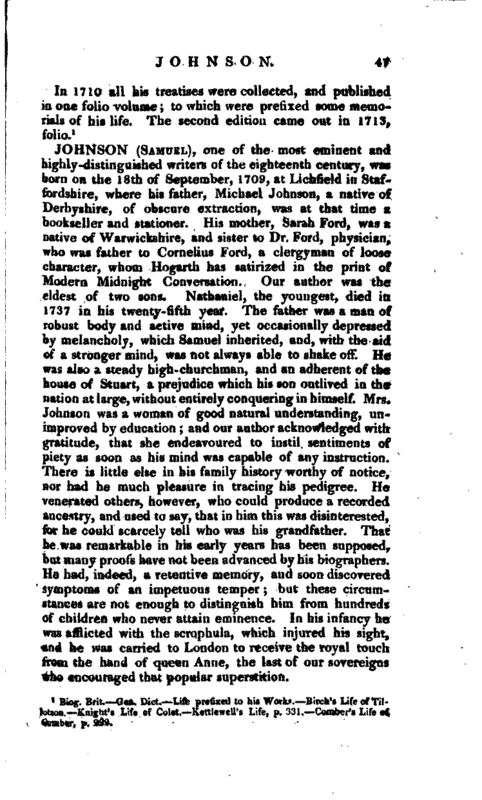 But Johnson never departed from exacting the just respect due to a man of letters, and was not to be appeased by the artifice of these protracted compliments. He could not even brook that his lordship should for a moment suppose him reconciled by his flattery, but immediately wrote that celebrated letter which has been so much admired as a model of dignified contempt. The allusion to the loss of his wife, and to his present situation, is exquisitely beautiful. “The notice which you have been pleased to take of my labours, had it been early, had been kind; but it has been delayed till I am indifferent, and cannot enjoy it till I Am Solitary, and cannot impart it till I am known, and do not want it.” Lord Chesterfield is said to have concealed his feelings on this occasion with his usual art, conscious, perhaps, that they were not to be envied. In 1755 the degree of M. A. was conferred upon him by the university of Oxford, after which (in May) his “Dictionary” was published in two large volumes, folio. Of a work so well known it is unnecessary to say more in this place, than that after the lapse of half a century, neither envy has injured, nor industry rivalled its usefulness or popularity. In the following year he abridged his “ | Dictionary into an octavo size, and engaged to superintend a monthly publication entitled” The Literary Magazine, or Universal Register.“To this he contributed a great many articles enumerated by Mr. Boswell, and several reviews of new books. 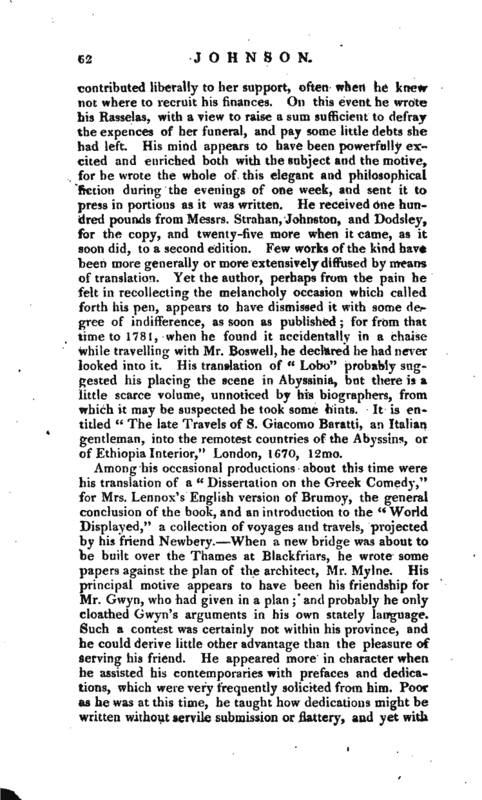 The most celebrated of his reviews, and one of his most finished compositions, both in point of style, argument, and wit, was that of Soame Jenyns’s” Free Inquiry into the nature and origin of Evil.“This attracted so much notice that the bookseller was encouraged to publish it separately, and two editions were rapidly sold. The Magazine continued about two years, after which it was dropped for want of encouragement. He wrote also in 1756 some essays in the” Universal Visitor," another magazine, which lasted only a year. 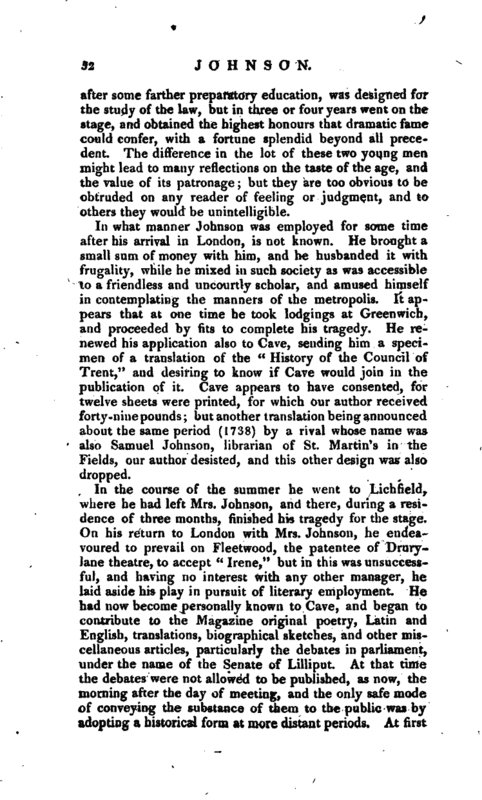 His friend Cave died in 1754, and, for whatever reason, Johnson’s regular contributions appear no more in the Gentleman’s Magazine. But he wrote a very elegant life of Cave, and was afterwards an occasional contributor. This, it would appear, was one of his worst years as to pecuniary matters. We find him, in the month of March, arrested for the sum of five pounds eighteen shillings and relieved by Mr. Richardson. His proposal for an edition of Shakspeare was again revived, and subscription tickets issued out, but it did not go to press for many years after. See his very tender letters on this subject in Boswell’s Life, vol. I. p. 315 et seqq. which are thus particularly referred to, as they are not to be found before the edition of 1807.
and had | contributed liberally to her support, often when he knew not where to recruit his finances. On this event he wrote his Rasselas, with a view to raise a sum sufficient to defray the expences of her funeral, and pay some little debts she had left. His mind appears to have been powerfully excited and enriched both with the subject and the motive, for he wrote the whole of this elegant and philosophical fiction during the evenings of one week, and sent it to press in portions as it was written. He received one hundred pounds from Messrs. Strahan, Johnston, and Dodsley, for the copy, and twenty-five more when it came, as it soon did, to a second edition. Few works of the kind have been more generally or more extensively diffused by means of translation. Yet the author, perhaps from the pain he felt in recollecting the melancholy occasion which called forth his pen, appears to have dismissed it with some degree of indifference, as soon as published; for from that time to 1781, when he found it accidentally in a chaise while travelling with Mr. Boswell, he declared he had never looked into it. His translation of” Lobo“probably suggested his placing the scene in Abyssinia, but there is a little scarce volume, unnoticed by his biographers, from which it may be suspected he took some hints. It is entitled” The late Travels of S. Giacomo Baratti, an Italian gentleman, into the remotest countries of the Abyssins, or of Ethiopia Interior," London, 1G70, 12mo. Among his occasional productions about this time were his translation of a “Dissertation on the Greek Comedy,” for Mrs. Lennox’s English version of Brumoy, the general conclusion of the book, and an introduction to the “World Displayed,” a collection of voyages and travels, projected by his friend Newbery. When a new bridge was about to be built over the Thames at Blackfriars, he wrote some papers against the plan of the architect, Mr. Mylne. His principal motive appears to have been his friendship for Mr. Gwyn, who had given in a plan; and probably he only cloathed Gwyn’s arguments in his own stately language. Such a contest was certainly not within his province, and he could derive little other advantage than the pleasure of serving his friend. He appeared more in character when he assisted his contemporaries with prefaces and dedications, which were very frequently solicited from him. Poor as he was at this time, he taught how dedications might be written without servile submission or flattery, and yet with | all the courtesy, compliment, and elegance which a liberal mind could expect. But an end was now approaching to his pecuniary embarrassments. In 1762. while he was proceeding with his edition of Shakspeare, he was surprised by the information, that his present majesty had been pleased to grant him a pension of three hundred pounds a year, not, as has been invidiously asserted, in order to induce him to write for administration, but as the reward of his literary merit. Had it been otherwise, he had surely the strongest inducement to have exerted his talents in favour of lord Bute, by whose recommendation the pension was grained, and who at this time wanted much abler support than the hired writers of government could supply. But it is well known that he wrote no political tract for nearly eight years afterwards. He now took a house in Johnson’s court, Fleet-street, and allotted an apartment for Mrs. Williams. In 1765 he was introduced to the late Mr. Thrale and family, a circumstance which contributed much to alleviate the solicitudes of life, and furnished him with the enjoyment of an elegant table and elegant society. ‘ Here an apartment was fitted up for him, which he occupied when he pleased, and he accompanied the family in their various summer excursions, which tended to exhilarate his mind and render the return of his constitutional melancholy less frequent. In the same year he received a diploma from Trinity college, Dublin, complimenting him with the title of doctor of laws; and after many delays, his edition of Shakspeare was published in eight volumes octavo. The preface is universally acknowledged to be one of the most elegant and acute of all his compositions. But as an illustrator of the obscurities of Shakspeare, it must be allowed he has not done much, nor was this a study for which he was eminently qualified. He was never happy when obliged to borrow from others, and he had none of that useful industry which indulges in research. Yet his criticisms have rarely been surpassed, and it is no small praise that he was the precursor of Steevens and Malone. The success of the Shakspeare was not great, although upon the whole it increased the respect with which the literary world viewed his talents. Kenrick made the principal attack on this work, which was answered by an Oxford student named Barclay. But neither the attack nor the answer attracted much notice. | In 1766 he furnished the preface, and some of the piece* which compose a volume of poetical “Miscellanies” by Mrs. Anna Williams. This lady was still an inmate in his house, and was indeed absolute mistress. Although her temper was far from pleasant, and she had now gained an ascendancy over him which she often maintained in a fretful and peevish manner, he forgot every thing in her distresses, and was indeed in all his charities, which were numerous, the most remote that can be conceived from the hope of gratitude or reward. His house was filled by dependants whose perverse tempers frequently drove him out of it, yet nothing of this kind could induce him to relieve himself at their expence. His noble expression was, “If 1 dismiss them, who will receive them r” Abroad, his society was now very extensive, and included almost every man of the age distinguished for learning, and many persons of considerable rank, who delighted in his company and conversation. In 1767, he had the honour to be admitted to a personal interview with his majesty, in the library of the queen’s palace. 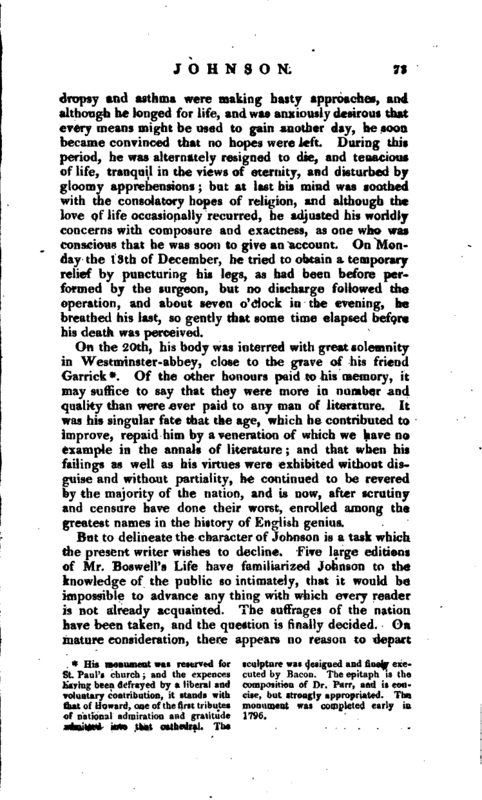 Of the conversation which passed, Mr. Boswell has given a very interesting and authentic account, which, it may here be mentioned, he prized at so high a rate, as to print it separately in a quarto sheet, and enter it in that form at Stationers’-hall, a few days before the publication of his “Life of Johnson.” He attempted in the same manner to secare Johnson’s letter to lord Chesterfield. In 1767, on the institution of the royal academy of arts, Johnson was appointed professor in ancient literature, and there probably was at that time some design of giving a course of lectures. But this, and the professorship of ancient history, are as yet mere sinecures. In 1770, his first political pamphlet made its appearance, in order to justify the conduct of the ministry and the House of Commons in expelling Mr. Wilkes, and afterwards declaring col. Luttrell to be duly elected representative for the county of Middlesex, notwithstanding Mr. Wilkes had the majority of votes. The vivacity and pointed sarcasm of this pamphlet formed its chief recommendation, and it continues to be read as an elegant political declamation; but it failed in its main object. It made no converts to the right of incapacitating Mr. Wilkes by the act of expulsion, and the ministry had not the courage to try the question of absolute incapacitation. 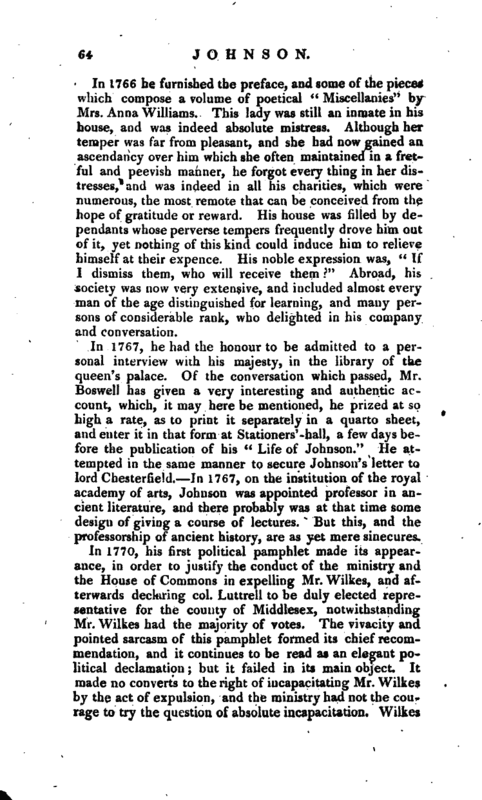 Wilkes | Jived to see the offensive resolutions expunged from the Journals of the House of Commons; and what seemed yet more improbable, to be reconciled to Johnson, who, with unabated dislike of his moral character, could not help ad* miring his classical learning and social talents* His pamphlet, which was entitled the “False Alarm,” was answered by two or three anonymous writers of no great note. In 1773, he carried into execution a design which he had long meditated, of visiting the western isles of Scotland. He arrived at Edinburgh on the 18th of August, and finished his journey on the 22jd of November. During this time be passed some days at Edinburgh, and then went by St. Andrew’s, Aberdeen, Inverness, and Fort Augustus, to the Hebrides, visiting the isles of Sky, Rasay, Col, Mull, Inchkenneth, and Icolmkill. He then travelled through Argyleshire by Inverary, and thence by Lochlomond and Dumbarton to Glasgow and Edinburgh. The popularity of his own account, which has perhaps been more generally read than any book of travels in modern times, and the “Journal” of his pleasant companion Mr. Boswell, render any farther notice of this journey unnecessary. The censure he met with is now remembered with indifference, and his “Tour” continues to be read without any of the unpleasant emotions which it first excited in those who contended that he had not stated the truth, or were unwilling that the truth should be stated. 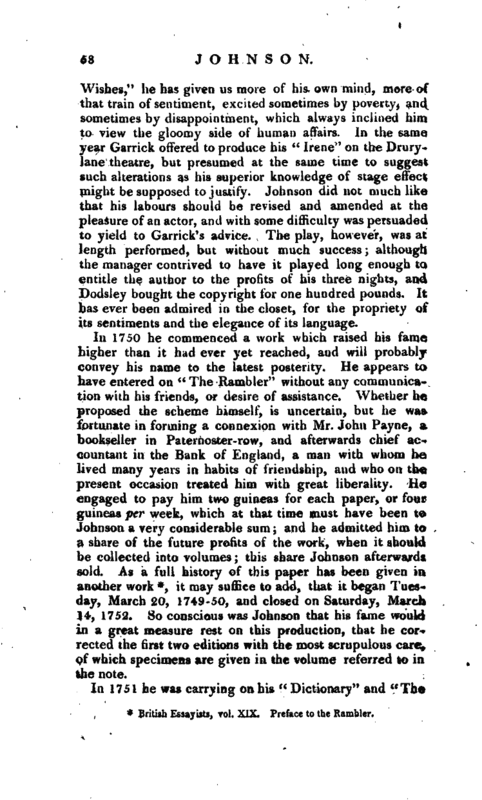 During his absence, his humble friend and admirer, Thomas Davies, bookseller, ventured to publish two volumes, entitled “Miscellaneous and Fugitive Pieces,” which he advertised in the newspapers, as the productions of the “Author of the Rambler.” Johnson was inclined to resent this liberty, until he recollected Davies’s narrow circumstances, when he cordially forgave him, and continued his kindness to him as usual. A third volume appeared soon after, but all its contents are not from Dr. Johnson’s pen. On the dissolution of parliament in 1774, he published a short political pamphlet entitled “The Patriot,” the principal object of which appears to have been to repress the spirit of faction which at that time was too prevalent, especially in the metropolis. It was a hasty composition, called for, as he informed Mr. Boswell, on one day, and written the next. The success, since his days, of those mock-patriots whom he has so ably delineated, is too decisive a proof that the reign of politic delusion is not to be shortened by eloquence or argument. | During his tour in Scotland, he made frequent inquiries respecting the authenticity of “Ossian’s Poems,” and received answers so unsatisfactory that both in his book of travels and in conversation, he did not hesitate to treat the whole as an imposture. 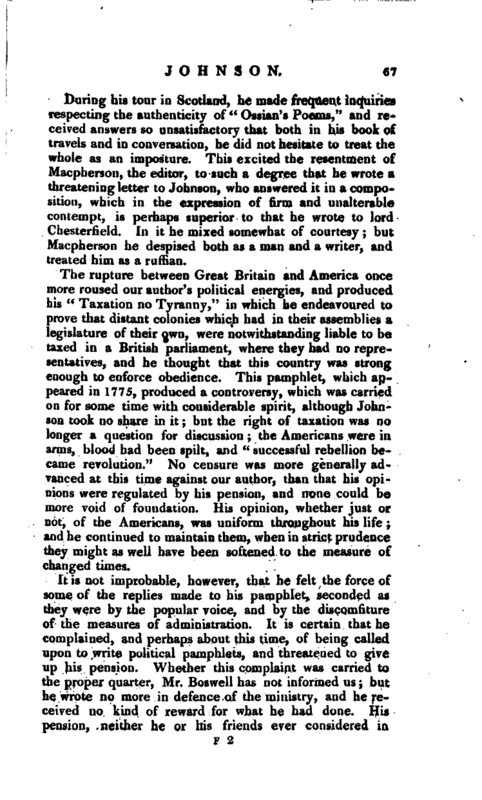 This excited the resentment of Macpherson, the editor, to such a degree that he wrote a threatening letter to Johnson, who answered it in a composition, which in the expression of firm and unalterable contempt, is perhaps superior to that he wrote to lord Chesterfield. In it he mixed somewhat of courtesy; but Macpherson he despised both as a man and a writer, and treated him as a ruffian. The rupture between Great Britain and America once more roused our author’s political energies, and produced his “Taxation no Tyranny,” in which he endeavoured to prove that distant colonies which had in their assemblies a legislature of their own, were notwithstanding liable to be taxed in a British parliament, where they had no representatives, and he thought that this country was strong enough to enforce obedience. This pamphlet, which appeared in 1775, produced a controversy, which was carried on for some time with considerable spirit, although Johnson took no share in it but the right of taxation was no longer a question for discussion the Americans were in arms, blood had been spilt, and " successful rebellion became revolution.’ 7 No censure was more generally advanced at this time against our author, than that his opinions were regulated by his pension, and none could be more void of foundation. His opinion, whether just or not, of the Americans, was uniform throughout his life; and he continued to maintain them, when in strict prudence they might as well have been softened to the measure of changed times. It is not improbable, however, that he felt the force of some of the replies made to his pamphlet, seconded ‘as they were by the popular voice, and by the discomfiture of the measures of administration. It is certain that he complained, and perhaps about this time, of being called upon to write political pamphlets, and threatened to give up his pension. Whether this complaint was carried to the proper quarter, Mr. Boswell has not informed us; but he wrote no more in defence of the ministry, and he received no kind of reward for what he had done. His pension, neither he or his friends ever considered in | that light, although it might make him acquiesce more readily in what the minister required. He was willing to do something for gratitude, but nothing for hire. A few months after the publication of his last pamphlet, he received his diploma of LL. D. from the university of Oxford, in consequence of a recommendation from the chancellor, lord North. It is remarkable, however, that he never assumed this title in writing notes or cards. In the autumn of this year, he went on a tour to France with Mr. and Mrs. Thrale. Of this tour Mr. Boswell has printed a few memorandums, which were probably intended as the foundation of a more regular narrative, but this he doesnot appear to have ever begun. As the tour lasted only about two months, it would probably have produced more sentiment than description. In 1777, he was engaged by the London booksellers to write short lives or prefaces to an edition of the English Poets; and this “being one of the most important of his literary undertakings, some account of its origin is necessary, especially as the precise share which belongs to him has been frequently misrepresented. It is perhaps too late now to inquire into the propriety of the decision of the House of Lords respecting literary property. It had not, however, taken place many months before some of the predicted consequences appeared. 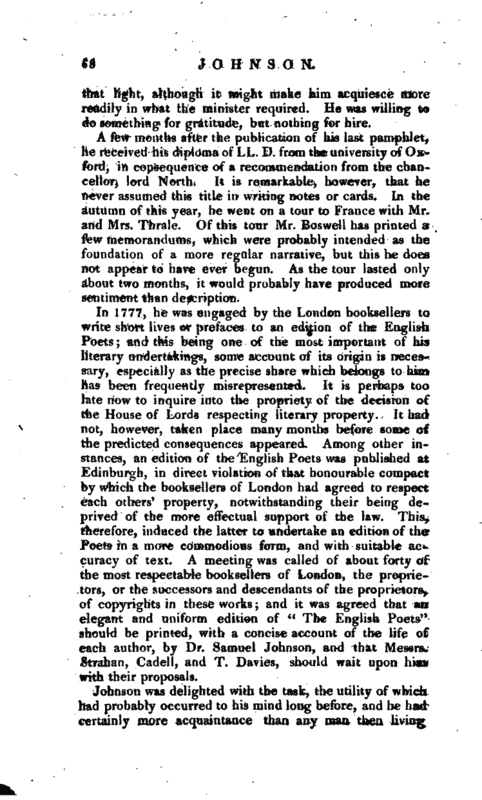 Among other instances, an edition of the English Poets was published at Edinburgh, in direct violation of that honourable compact by which the booksellers- of London had agreed to respect each others’ property, notwithstanding their being deprived of the more effectual support of the law. This,. therefore, induced the latter to undertake an edition of the Poets in a more commodious form, and with suitable accuracy of text. A meeting was called of about forty of the most respectable booksellers of London, the proprietors, or the successors and descendants of the proprietors, of copyrights in these worlds; and it was agreed that an elegant and uniform edition of” The English Poets" should be printed, with a concise account of the life of each author, by Dr. Samuel Johnson, and that Messrs. Strahan, Cadell, and T. Davies, should wait upon him with their proposals. 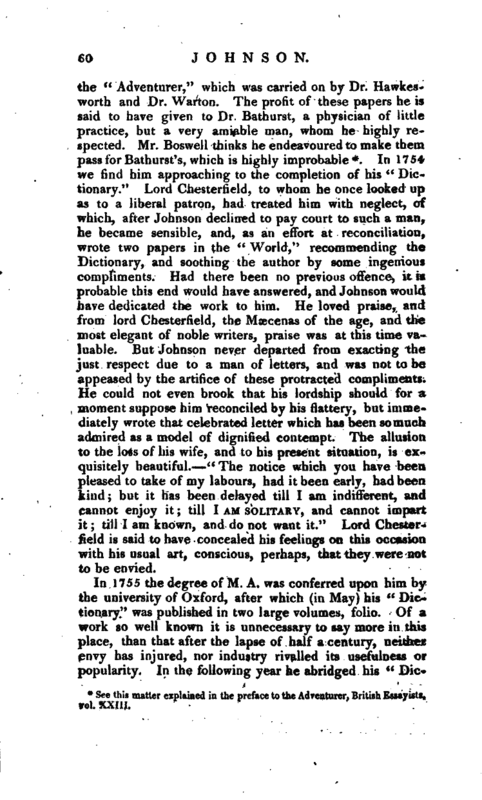 Johnson was delighted with the task, the utility of which had probably occurred to his mind long before, and he had certainly more acquaintance than any man then living | with the poetical biography of his country, and appeared to he best qualified to illustrate it by judicious criticism. Whether we consider what he undertook, or what he performed, the sum of two hundred guineas, which he demanded, will appear a very trivial recompense. His original intention, and all indeed that was expected from him, was a very concise biographical and critical account of each poet; but he had not proceeded far before he began to enlarge the lives to the present extent, and at last presented the world with such a body of criticism as was scarcely to be expected from one man, and still less from one now verging on his seventieth year. 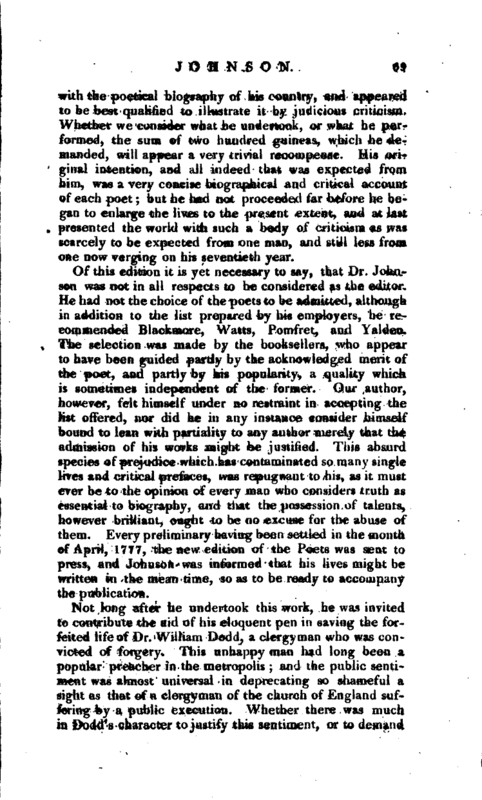 Of this edition it is yet necessary to say, that Dr. Johnson was not in all respects to be considered as the editor. He had not the choice of the poets to be admitted, although in addition to the list prepared by his employers, he recommended Blackmore, Watts, Pomfret, and Yalden. The selection was made by the booksellers, who appear to have been guided partly by the acknowledged merit of the poet, and partly by his popularity, a quality which, is sometimes independent of the former. Our author, however, felt himself under no restraint in accepting the list offered, nor did he in any instance consider himself bound to lean with partiality to any author merely that the admission of his works might be justified. This absurd species of prejudice which lias contaminated so many single lives and critical prefaces, was repugnant to his, as it must ever be to the opinion of every man who considers truth as essential to biography, and that the possession of talents, however brilliant, ought to be no excuse for the abuse of them. 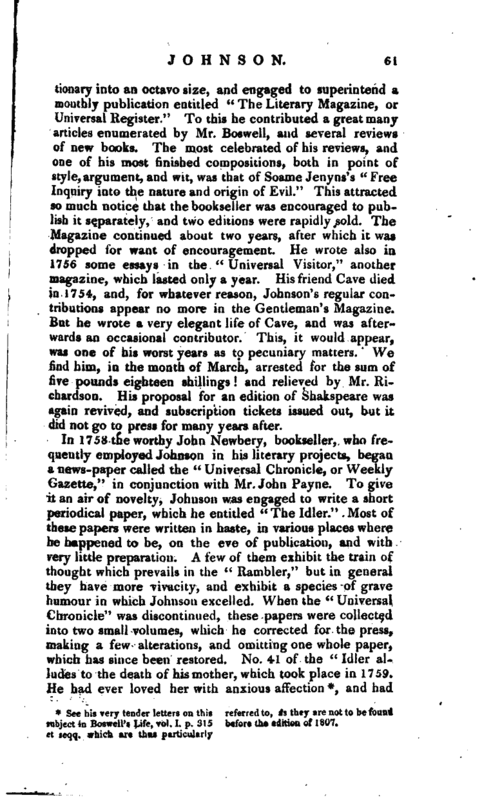 Every preliminary having been settled in the month of April, 1777, the new edition of the Poets was sent to press, and Johnson was informed that his lives might be written in the mean time, so as to be ready to accompany the publication. Not long after he undertook this work, he was invited to contribute the aid of his aloquent pen in saving the forfeited life of Dr. William Dodd, a clergyman who was convicted of forgery. This unhappy man had long been a popular preacher in the metropolis; and the public sentiment was almost universal in deprecating so shameful a sight as that of a clergyman of the church of England suffering by a public, execution. Whether there was much in Dodd’s character to justify this sentiment, or to demand | the interference of the corporation of London, backed by the petitions of thousands of the most distinguished and wealthy citizens, may perhaps be doubted. 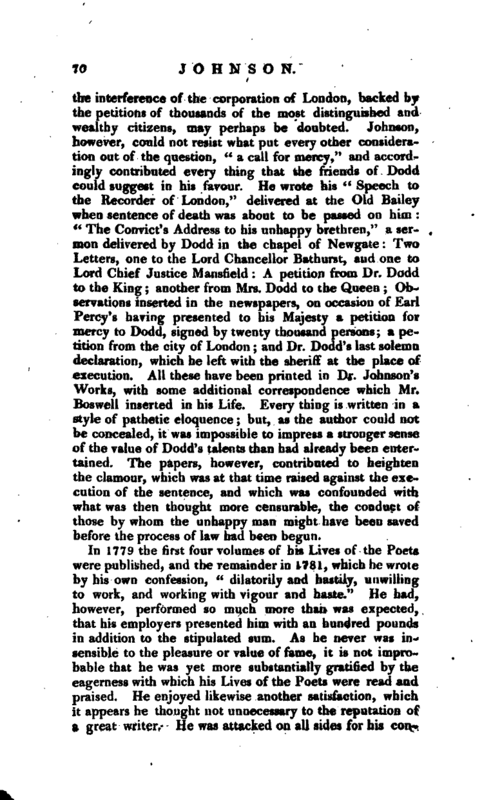 Johnson, however, could not resist what put every other consideration out of the question, “a call for mercy,” and accordingly contributed every thing that the friends of Dodd could suggest in his favour. He wrote his “Speech to the Recorder of London,” delivered at the Old Bailey when sentence of death was about to be passed on him “The Convict’s Address to his unhappy brethren,” a sermon delivered by Dodd in the chapel of Newgate Two Letters, one to the Lord Chancellor Bathurst, and one to Lord Chief Justice Mansfield A petition from Dr. Dodd to the King another from Mrs. Dodd to the Queen Observations inserted in the newspapers, on occasion of Earl Percy’s having presented to his Majesty a petition for mercy to Dodd, signed by twenty thousand persons; a petition from the city of London; and Dr. Dodd’s last solemn declaration, which he left with the sheriff at the place of execution. All these have been printed in Dr. Johnson’s VVorks, with some additional correspondence which Mr. Boswell inserted in his Life. Every thing is written in a style of pathetic eloquence; but, as the author could not be concealed, it was impossible to impress a stronger sense of the value of Dodd’s talents than had already been entertained. 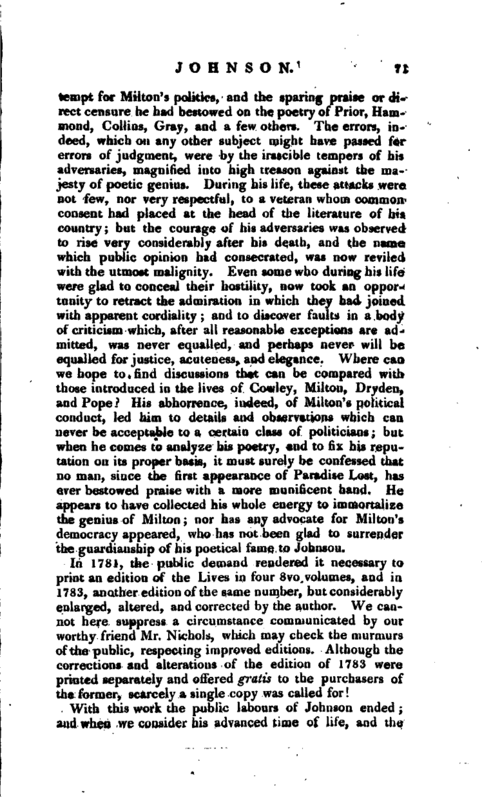 The papers, however, contributed to heighten the clamour, which was at that time raised against the execution of the sentence, and which was confounded with what was then thought more censurable, the conduct of those by whom the unhappy man might have been saved before the process of law had been begun. Jn 1779 the first four volumes of his Lives of the Poets were published, and the remainder in 1781, which he wrote by uis own confession, “dilatorily and hastily, unwilling to work, and working with vigour and haste.” He had, however, performed so much more than was expected, that his employers presented him with an hundred pounds in addition to the stipulated sum. As he never was insensible to the pleasure or value of fame, it is not improbable that he was yet more substantially gratified by the eagerness with which his Lives of the Poets were read and praised. He enjoyed likewise another satisfaction, which it appears he thought not unnecessary to the reputation of a great writer. He was attacked on all sides for his | contempt for Milton’s politics, and the sparing praise or direct censure he had bestowed on the poetry of Prior, Hammond, Collins, Gray, and a few others. The errors, indeed, which on any other subject might have passed for errors of judgment, were by the irascible tempers of his adversaries, magnified into high treason against the majesty of poetic genius. During his life, these attacks were not few, nor very respectful, to a veteran whom common consent had placed at the head of the literature of his country; but the courage of his adversaries was observed to rise very considerably after his death, and the name which public opinion had consecrated, was now reviled with the utmost malignity. Even some who during his life were glad to conceal their hostility, now took an opportunity to retract the admiration in which they had joined with apparent cordiality; and to discover faults in a body of criticism which, after all reasonable exceptions are admitted, was never equalled, and perhaps never will be equalled for justice, acuteness, and elegance. Where can we hope to find discussions that can be compared with those introduced in the lives of Cowley, Milton, Dryden, and Pope? His abhorrence, indeed, of Milton’s political conduct, Jed him to details and observations which can, never be acceptable to a certain class of politicians; but when he comes to analyze his poetry, and to fix his reputation on its proper basis, it must surely be confessed that no man, since the first appearance of Paradise Lost, has ever bestowed praise with a more munificent hand. He appears to have collected his whole energy to immortalize the genius of Milton; nor has any advocate for Milton’s democracy appeared, who has not been glad to surrender the guardianship of his poetical fame to Johnson. In 1781, the public demand rendered it necessary to print an edition of the Lives in four 8vo volumes, and in 1783, another edition of the same number, but considerably enlarged, altered, and corrected by the author. We- cannot here suppress a circumstance communicated by our worthy friend Mr. Nichols, which may check the murmurs of the public, respecting improved editions. Although the corrections and alterations of the edition of 1783 were printed separately and offered gratis to the purchasers of the former, scarcely a single copy was called for! With this work the public labours of Johnson ended; and when we consider his advanced time of life, and the | almost unabated vigour of his mind, it may be surely added, that his sun set with unrivalled splendour. But the infirmities of age were now undermining a constitution that had kept perpetual war with hereditary disease, and his most valued friends were dropping into the grave before him. He lost Mr. Thrale and Mrs. Williams; his home became cheerless, and much visiting was no longer convenient. 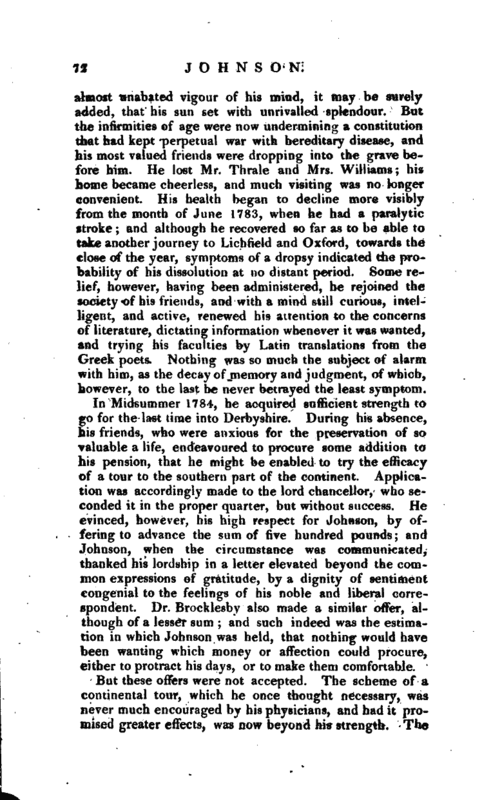 His health began to decline more visibly from the month of June 1783, when he had a paralytic stroke; and although he recovered so far as to be able to take another journey to Lichfield and Oxford, towards the close of the year, symptoms of a dropsy indicated the probability of his dissolution at no distant period. Some relief, however, having been administered, he rejoined the society of his friends, and with a mind still curious, intelligent, and active, renewed his attention to the concerns of literature, dictating information whenever it was wanted, and trying his faculties by Latin translations from the Greek poets. Nothing was so much the subject of alarm with him, as the decay of memory and judgment, of which, however, to the last he never betrayed the least symptom. In Midsummer 1784, he acquired sufficient strength to go for the last time into Derbyshire. During his absence, his friends, who were anxious for the preservation of so valuable a life, endeavoured to procure some addition to his pension, that he might be enabled to try the efficacy of a tour to the southern part of the continent. Application was accordingly made to the lord chancellor, who seconded it in the proper quarter, but without success. He evinced, however, his high respect for Johnson, by offering to advance the sum of five hundred pounds; and Johnson, when the circumstance was communicated, thanked his lordship in a letter elevated beyond the common expressions of gratitude, by a dignity of sentiment congenial to the feelings of his noble and liberal correspondent. Dr. Brocklesby also made a similar offer, although of a lesser sum; and such indeed was the estimation in which Johnson was held, that nothing would have been wanting which money or affection could procure, either to protract his days, or to make them comfortable. But these offers were not accepted. The scheme of a continental tour, which he once thought necessary, was never much encouraged by his physicians, and had it promised greater effects, was now beyond his strength. The | dropsy and asthma were making hasty approaches, and although he longed for life, and was anxiously desirous that every means might be used to gain another day, he soon became convinced that no hopes were left. During this period, he was alternately resigned to die, and tenacious of life, tranquil in the views of eternity, and disturbed by gloomy apprehensions; but at last his mind was soothed with the consolatory hopes of religion, and although the love of life occasionally recurred, he adjusted his worldly concerns with composure and exactness, as one who was conscious that he was soon to give an account. On Monday the 13th of December, he tried to obtain a temporary relief by puncturing his legs, as had been before performed by the surgeon, but no discharge followed the operation, and about seven o’clock in the evening, he breathed his last, so gently that some time elapsed before his death was perceived. On the 20th, his body was interred with great solemnity in Westminster-abbey, close to the grave of his friend Garrick*. Of the other honours paid to his memory, it may suffice to say that they were more in number and quality than were ever paid to any man of literature. It was his singular fate that the age, which he contributed to improve, repaid him by a veneration of which we have no example in the annals of literature; and that when his failings as well as his virtues were exhibited without disguise and without partiality, he continued to be revered by the majority of the nation, and is now, after scrutiny and censure have done their worst, enrolled among the greatest names in the history of English genius. * His monument was reserved for sculpture was designed and finely exeSt. Paul’s church; and the expences cuted by Bacon. The epitaph is the having bee defrayed by a liberal and composition of Dr. Parr, and is coovoluntary contribution, it stands with cise, but strongly appropriated. The that of Howard, one of the first tributes monument was completed early in of national admiration and gratitude 1796, admitted into that cathedral. The | from the generally received opinions as to the rank Johnson holds among men of genius and virtue, a rank which those who yet capriciously dwell on his tailings, will find it difficult to disturb. His errors have been brought forward with no sparing hand both by his friends and his enemies, yet when every fair deduction is made from the reputed excellence of his character as a man and a writer, enough in our opinion will remain to gratify the partiality of his admirers, and to perpetuate the public esteem. It is unpleasant, however, to quit a subject, which, the more it is revolved, serves to gladden the mind with pleasing recollections. There are surely circumstances in the history of Johnson which compel admiration in defiance of prejudice or envy. That a man of obscure birth, of manners by no means prepossessing, whose person was forbidding, whose voice was rough, inharmonious, and terrifying, whose temper was frequently harsh and overbearing; that such a man should have forced his way into the.society of a greater number of eminent characters than perhaps ever gathered round an individual; that he should not only have gained but increased their respect to a degree of enthusiasm, and preserved it unabated for so long a series of years; that men of all ranks in life, and of the highest degrees of mental excellence, should have thought it a duty, and found it a pleasure, not only to tolerate his occasional roughness, but to study his humour, and submit to his controul, to listen to him with the submission of a scholar, and consult him with the hopes of a client All this surely affords the strongest presumption that such a man was remarkable beyond the usual standard of human excellence. Nor is this inference inconsistent with the truth, for it appears that whatever merit may be attributed to his works, he was perhaps yet more to be envied in conversation, where he exhibited an inexhaustible fertility of imagination, an elegance and acuteness of argument, and a ready wit, such as never appear to have been combined in one man. And it is not too much to say that whatever opinion was entertained by tftose who knew him only in his writings, it never could have risen to that pitch of admiration which has been excited by the labours of his industrious biographer. His death formed a very remarkable aera in the literary world. For a considerable time the periodical journals, as | well as general conversation, were eagerly occupied on an event which was the subject of universal regret; and every man hastened with such contributions as memory supplied, to illustrate a character in which all took a lively interest. Numerous anecdotes were published, some authentic and some imaginary, and the general wish to knew more of Johnson was for some years insatiable. 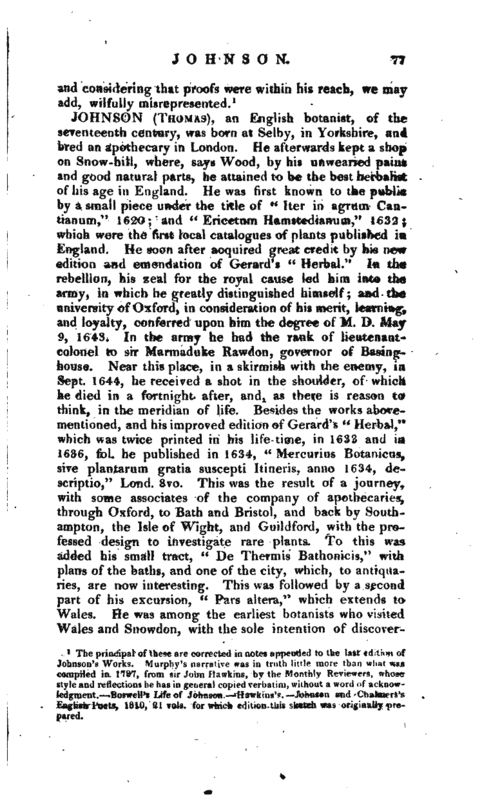 At length the proprietors of his printed works met to consider of a complete and uniform edition, but as it was feared that the curiosity which follows departed genius might soon abate, some doubt was entertained of the policy of a collection of pieces, the best of which were already in the hands of the public in various forms; but this was fortunately overruled, and these collected Works have very recently been printed for the fifth time, and will probably be long considered as a standard book in every library. Less fortunately, however, sir John Hawkins, who was one of Johnson’s executors, and professed to be in possession of materials for his Life, was engaged to write that Life, as well as to collect his Works. They accordingly appeared in 1787, in 11 vols. 8vo. Of the Life it is unnecessary to add any thing to the censure so generally passed. Sir John spoke his mind, perhaps honestly but his judgment must have been as defective as his memory,when he decided with so much prejudice and so little taste or candour, on the merits of his author, and of other eminent persons, whom, as a critic humorously said, “he brought to be tried at the Middlesex quarter sessions.” In collecting the Works, he inserted some which no man could suspect to be Johnson’s, while he omitted other pieces that had been acknowledged. A more correct arrangement, however, has been since adopted. 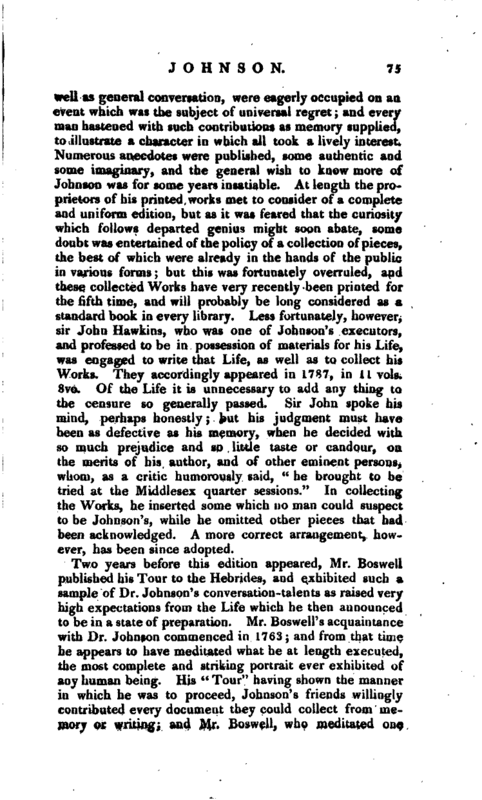 Two years before this edition appeared, Mr. Boswell published his Tour to the Hebrides, and exhibited such a sample of Dr. Johnson’s conversation-talents as raised very high expectations from the Life which he then announced to be in a state of preparation. Mr. Boswell’s acquaintance with Dr. Johnson commenced in 1763; and from that time he appears to have meditated what he at length executed, the most complete and striking portrait ever exhibited of any human being. His “Tour” having shown the manner in which he was to proceed, Johnson’s friends willingly contributed every document they could collect from memory or writing; and Mr. Boswell, who meditated one | volume only, was soon obliged to extend his work to two bulky quartos. These were published in 1791, and bought up with an avidity which their wonderful variety of entertainment, vivacity, anecdote, and sentiment, amply justified. Five or six very large editions have since appeared, and it seems to be one of those very fortunate and fascinating books of which the public is not likely to tire. Mr. Boswell, indeed, has proved, contrary to the common opinion, and by means which will not soon be repeated, that the life of a mere scholar may be rendered more instructive, more entertaining, and more interesting, than than that of any other human being. And although the “confidence of private conversation” has been thought to be sometimes violated in this work, for which no apology is here intended, yet the world seems agreed to forgive this failing in consideration of the pleasure it has afforded; that wonderful variety of subjects, of wit, sentiment, and anecdote, with which it abounds; and above all, the valuable instruction it presents on many of the most important duties of life. It must be allowed that it created some enemies to Dr. Johnson among those who were not enemies before this disclosure of his sentiments. Vanity has been sometimes hurt, and vanity has taken its usual rerenge. 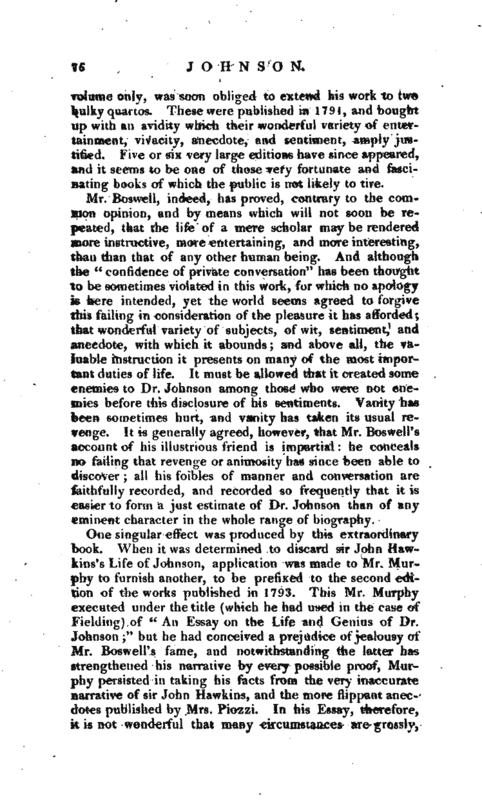 It is generally agreed, however, that Mr. Boswell’s account of his illustrious friend is impartial: he conceals no failing that revenge or animosity has since been able to discover; all his foibles of manner and conversation are faithfully recorded, and recorded so frequently that it is easier to form a just estimate of Dr. Johnson than of any eminent character in the whole range of biography. The principal of these are corrected in notes appended to the last edition of Johnson’s Works. Murphy’s narrative was in truth little more than what was compiled in 1787, from sir John Hawkins, by the Monthly Reviewers, whose style and reflections he has in general copied verbatim, without a word of acknowledgment. —Boswell’s Life of Johnson. Hawkins’s. Johnson and Chalmers’s English Poets, 1810, 21 vols. for which edition this sketch was originally prepared.